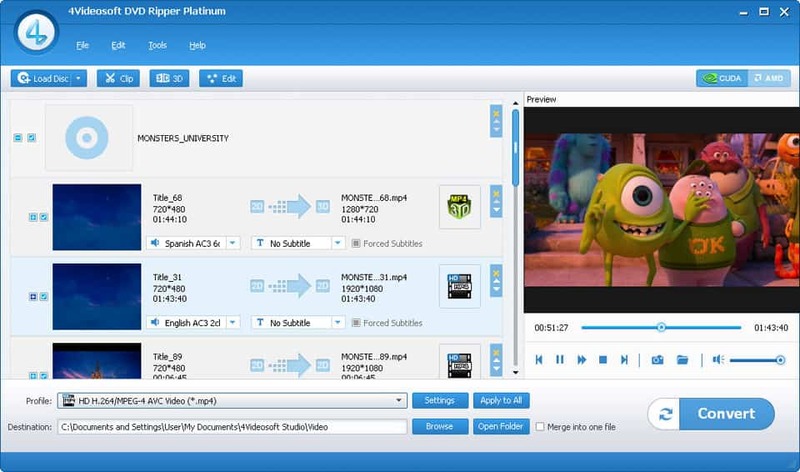 4Videosoft DVD Ripper Platinum can convert DVD movies to 3D movies and general video. You can enjoy your output videos your portable devices like Samsung Galaxy S4, Samsung Galaxy Note 3, iPhone 5S, iPhone 5C, iPad air, etc. 4Videosoft DVD Ripper Platinum can convert DVD movies to 3D movies and MP4, MOV, M4V, WMV, AVI, FLV, etc. with high speed and quality. You are able to edit your videos with the powerful 3D and common editing functions. 4Videosoft DVD Ripper Platinum is capable of converting DVD movies to 3D movies easily. You are able to enjoy the converted 3D movies with 3D TV or other compatible 3D devices without limitation. You are enabled you to convert DVD movies to general video formats. And you can enjoy them on your portable devices like iPhone 5S, iPhone 5C, iPhone 5, iPad air, Samsung Galaxy Note 3, Samsung Galaxy S4, HTC one, BlackBerry and more. 4Videosoft DVD Ripper Platinum provides you with the best editing functions to optimize your video with splendid editing functions. You can edit your output video by 3D effect like anaglyph, split screen. It can also help you use the ordinary editing functions to beatify the video. These splendid editing functions allow you to modify video effect by adjusting brightness, contrast, saturation, hue and volume. It can clip your videos into several segments. And you are able to reset the video length as your preference. You can also cut off the black edge as well as add your favorite text and image watermark. 4Videosoft DVD Ripper Platinum enables you to preview your video and take snapshot. Now it highly improves the conversion speed and quality. You can finish your conversion within several clicks. AV Video Converter - Powerful, easy to use video conversion software converts among all popular video and audio formats with fast conversion speed. Aneesoft Apple TV Video Converter for Mac is the easiest and fastest way to convert video files including HD to Apple TV MP4 video format and MP3, M4A audio formats on Mac OS. Convert and enjoy video entertainment on widescreen TV with Apple TV.